Duck-hunting myths get passed around so much they are eventually taken as fact. But it’s time to rethink these widely held beliefs. I had joined friends for a duck hunt on a popular wildlife management area where blinds were close and hunting pressure was heavy. The parking lot had been busy in the predawn with hunters launching boats and scurrying to their blinds. It was going to be a “full house day,” and my friends’ blind was square in the middle of the pack. I’d heard similar advice plenty times in my five-plus decades of waterfowling, and some times and places it’s true. However, this is a judgment call that should be made each new day. Sometimes even heavily pressured ducks respond better to aggressive calling than to keeping quiet and letting them fly on by. This day proved to be such a case. We started out calling very little and shooting very little. But after an hour of watching other blinds dominate the action, we started calling more forcefully, and the ducks responded positively. We wound up with a generous bag. “Keep your call in your pocket” is just one of several duck-hunting myths under which hunters labor. Misconceptions abound in this sport. Some tactic works one time for a hunter, and he embraces it as gospel from then on. He also shares his idea with others who pass it on, and soon a new delusion is taken for truth. In the process, hunters outwit themselves instead of the birds. 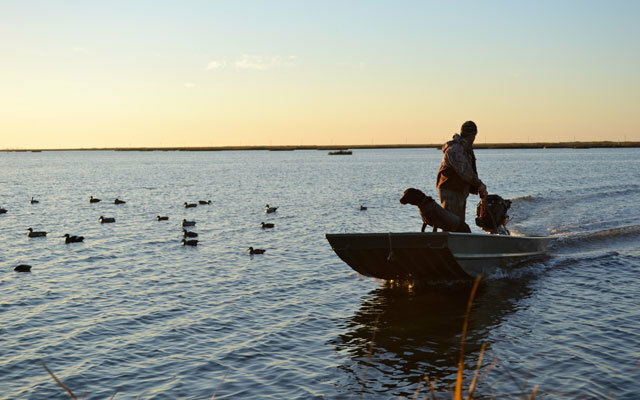 Following are five widely held duck-hunting beliefs that hunters might reconsider. As conditions change, ducks also change in terms of how they respond to various hunting tactics. Few things are constant in this sport. What works one day may be ineffective the next. This is why hunters should keep open minds and experiment to find the best approach to work birds. To the contrary, some days hunters fare better by calling as much and as loud as they can. By doing so, they can gain ducks’ attention and convince them to deviate from where they were going to start with. Here’s a good example. My partners and I hunt in a flooded rice field in Missouri, and most days we see high flights of ducks coming from the northeast and heading southwest. We don’t know where they’re coming from or where they’re going, but it’s obvious they’re not coming to us. However, by calling loud and hard — everybody in the pit — we’re able to pull some of these birds in. We might back off on the calls when a flight breaks down and starts circling. But that’s usually after we’ve demanded (not asked!) that the ducks come to check out the racket. The point is, hunters should investigate each new day with how much they need to call. If the ducks are ignoring you, don’t assume you need to tone it down. Try calling like crazy! What do you have to lose by sounding like a refuge and inviting passing birds to join the party? Who started this bit of folklore? It might be true for divers or sea ducks on big water, but when it comes to mallards, pintails, gadwalls, teal and other puddlers, I’ll take a sunny, windy day anytime. My favorite hunting conditions for these birds are a bright blue sky, temperature 35 to 45 degrees F and winds blowing 10 to 20 mph. I’m not sure why sunny days are better than overcast days, but I have a two-part theory. Visibility is better on bright days, and ducks can spot decoys at longer distances. Thus, there’s a higher chance of them seeing and coming to a spread. Also, because of hard shadows on bright days, I feel ducks are unlikely to see unnatural detail in decoys and blinds. Thus, they are less likely to shy away if everything in the spread isn’t perfect. Whatever, on most days, my partners and I much prefer sunshine over clouds. We watch weather forecasts and pick days when the sun will be out. This isn’t to say we don’t ever enjoy good shooting on overcast days. We do, but given the choice, we’ll take cloudless days anytime. I used to buy into this old wives tale; emphasis on “used to.” Today, though, I don’t hustle quite so hard to be in the pit or blind, loaded and waiting, when shooting time arrives. True, there’s usually a flurry of waterfowl activity at dawn, and in some locales, a hunter’s best chance at the birds might come in the first minutes of legal shooting time (in most places, 30 minutes before dawn). In such cases I would advise being on site and ready to go when the magic hour arrives. However, ducks fly in flurries, and when the dawn flurry ends, another one usually begins an hour or so later. Then another activity peak comes around midmorning to noon. These periods of activity in a particular area may be dictated by such factors as distance from a refuge, when ice melts, when hunter activity level in nearby areas peaks, etc. We’ve learned that we fare just about as well by showing up 30 to 45 minutes later than legal shooting time. We may miss a few early shooting opportunities, but on good days we still fill our limits. Maybe it’s an age thing, but those extra few minutes of sleep and non-hurried preparation make the day more pleasant, and not being in the blind for the opening bell hasn’t hurt our harvest rate. Also, going in a little later allows local ducks to feed until dawn and leave without being pressured, thus keeping them around longer. No question, there is a unique excitement for duck hunters surrounding cold-front days. Those are the great, memorable days when new birds arrive from up the flyway. The wind is usually brisk. The decoys are moving, and the ducks are working. What’s not to like about this scenario? Nothing, but the point of contention comes over the word “best.” Our club records indicate many of our “best” days have come with the wind blowing from the south. We weren’t picking up northern birds, but we were getting great working action from the ones on hand. For example, a few years back, I’d quit hunting my blind in Kentucky because the weather was abnormally warm and the ducks hadn’t been stirring. (Warm temperatures mean lower metabolism in ducks, thus less feeding.) However, after a three-day absence, a friend who hunted the adjoining farm called me with some unanticipated news. “Ducks are pouring in from the south,” he alerted me. “They’re riding the southerly breezes back up the flyway.” Knowing this, I returned to the blind the next morning and enjoyed a shoot that rivaled many of my best cold-front days. Point is, don’t get caught in the trap of anticipating when ducks will fly and work. Yes, some days are lead-cinch bets. However, ducks also will fly on other days that are far from ideal weather-wise (at least from the hunter’s perspective). Scout continuously, and go hunting whenever you can. There aren’t many cold-front days in an average season, but there are a lot of days when the ducks move well. More baloney! I’ve killed many ducks over gallon milk jugs coated with black roofing tar. I’ve kept faded, beaten-up, shot-up decoys in my spread. (If a decoy floats, it’s “on the team.”) I’ve painted and patched and mixed old decoys with new with great success. Now for the caveat. I have nothing against a shiny new spread. Fresh-from-the-box decoys look great and draw ducks with real effectiveness. But are they better than older decoys? In most situations, I would answer no. In summary, duck hunting is a game of variables and subtleties, and hunters must keep open minds as to how and when they hunt. No “rule” applies to every day and circumstance. No one style of calling, no particular hunting conditions, no time or decoy strategy or whatever works best all the time. Instead, smart hunters are those who toss the “rules” out the window and constantly adjust their tactics according to what the ducks are telling them they want. Keep an open mind about old beliefs in this sport. Sometimes they work, but other times they can steer hunters to disappointment. Indeed, rules are made to be broken, and in duck hunting, thinking and acting outside the box can be the keys to some of the season’s best shooting.